The 7th Edition of Chennai Marathon – the Skechers Performance Chennai Marathon, the largest sporting event in Chennai took place on 6th January 2019. 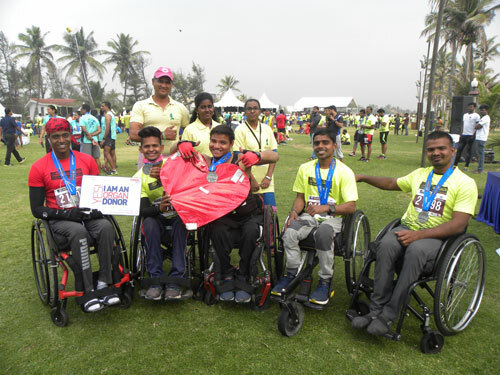 It was organized by Chennai Runners, a not-for-profit organization run by passionate runner-volunteers since 2006. It is one of the few running events in the country that is entirely organized by the running community. The Chennai Marathon is now the country’s second largest marathon after the Mumbai marathon. This year’s event saw over 25,000 participants running in the marathon. It was flagged off from the YMCA ground Nandanam and came to a finish at VGP Golden Beach. 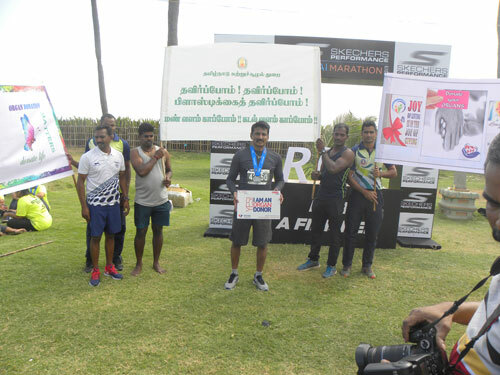 Dr K. Jayanth Murali, IPS, Director and Additional Director General of Police, Vigilance and Anticorruption, Tamil Nadu and holder of an Asian record in the half marathon category in 2018, attempted a new Asian Record by running the entire 42.195 km with his mouth covered with duct tape, breathing only through his nostrils. The aim of setting the record was to create awareness on “ban of single time use of plastics ordered by the Government of Tamil Nadu” as well as on “Organ Donation”. His police officer colleagues had also joined him in running and carried banners displaying educative messages on these two themes. By 10:45AM he had completed the full marathon and arrived at VGP Golden Beach having started at 4:00 AM. He spoke about what prompted him to participate in the marathon and the difficulties he faced while running with his mouth duct-taped. 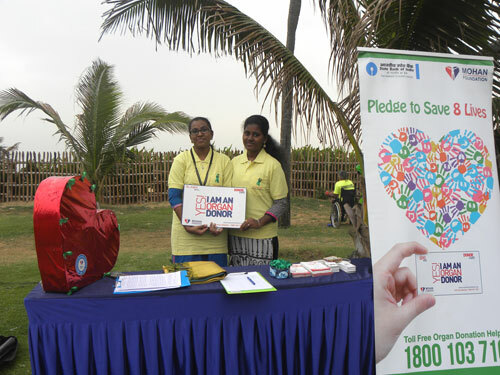 MOHAN Foundation had set up an information desk at VGP Golden Beach to create awareness on organ donation for runners who participated in the Chennai Marathon. Mr. T. S. Siva Shankar - Helpline Executive, MOHAN Foundation set up the desk with registration forms, donor cards, green ribbons, and brochures. S V Ajitha and J Keerthana, Interns from MMM College of Allied Health Sciences and Mr. Aubert Kennedy of MOHAN Foundation accompanied Mr. Siva Shankar at this event. They interacted with people who visited the information desk set up near the prize distribution stage. Mr. Siva Shankar explained the concepts of organ donation to everyone who visited the desk. The one-to-one interactions were beneficial to the visitors and many doubts got clarified. Donor cards, green ribbons and brochures were given to around 6 participants who registered as organ donors. MOHAN Foundation is thankful to Dr. Jayanth Murali for attempting this extraordinary feat on behalf of the organization for the cause. We are also grateful that he had dedicated his earlier India Book of Records citation to the Foundation.